ClearOne Advantage offers debt settlement to consumers struggling with unsecured debts like credit card and medical debt. To date, they have resolved over $1 billion. Since being founded in 2007 by debt negotiation financial experts, ClearOne Advantage has settled over $1 billion in unsecured debt. Their goal is to have your debt reduced drastically before you make any payment. In addition to debt settlement, their additional services include credit counseling, consolidation loans, and bankruptcy. They are based out of Baltimore, Maryland and offer services in 22 states: Alaska, Alabama, Arkansas, Arizona, California, Florida, Iowa, Indiana, Kentucky, Louisiana, Massachusetts, Maryland, Michigan, Missouri, Nebraska, North Carolina, New Mexico, New York, Oklahoma, Pennsylvania, Texas, and Virginia. ClearOne Advantage offers a free initial consultation with a financial expert to determine if you are right for their services. Couples can even combine their debt for a lone debt settlement plan. To qualify, you must have at least $10,000 in debt, which includes credit card debt, personal loans, child support, collections, and payday loans. However, they do not deal with mortgages and payday loans. If you are accepted into the program after discussing your finances and debts with an experienced consultant, you can enroll by filling out the required information, submitting it either through mail or online. Once you are enrolled, you set aside funds to put into your settlement account and when you have saved up enough, ClearOne Advantage negotiates with your creditors to reduce your debt. When all the settlements are reached, you begin paying your debts. ClearOne Advantage does not charge any upfront fees and only asks for payment once a settlement is reached. Although each case is different, you can expect to finish the program in two to three years. For those who want additional resources, they provide educational articles and videos on personal finances. Customers can even keep track of their progress through an online dashboard. All of your personal information is kept secure on the company’s servers and protected by Secure Sockets Layer technology. In the case that your debts are not settled, ClearOne Advantage guarantees a full refund of your account funds and settlement fees as long as you notify them within 30 days of your signed agreement. Accredited service: ClearOne Advantage holds several accreditations, including an A+ from the BBB (Better Business Bureau), the AFCC (American Fair Credit Council), USOBA (US Organization of Bankruptcy Alternatives), IAPDA (International Association of Professional Debt Arbitrators), and FTC accreditations. Experienced representatives: ClearOne Advantage is a large company with around 200 people and years of experience in the financial sector. Their representatives are knowledgeable and can be reached by email, phone, and fax. They are even active on social media if you want to keep updated through a different platform. They offer extra educational resources. Free initial consultation: Simply fill out a form on their website. Money back guarantee: You are eligible to receive a 90 day full refund. ClearOne Advantage only accepts debt of $10,000 or more, which is higher than many of their competitors. They are only available in 22 states: Alaska, Alabama, Arkansas, Arizona, California, Florida, Iowa, Indiana, Kentucky, Louisiana, Massachusetts, Maryland, Michigan, Missouri, Nebraska, North Carolina, New Mexico, New York, Oklahoma, Pennsylvania, Texas, and Virginia. ClearOne Advantage collects your information like many other debt settlement companies do, but they state that they use it to improve their services and only disclose your information to third parties that are affiliated companies. 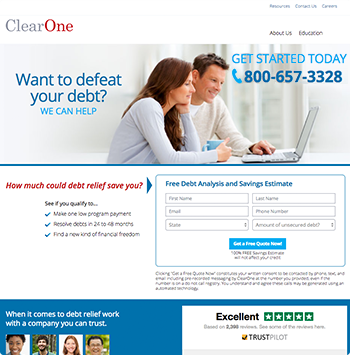 ClearOne Advantage charges fees of 20 - 25%, which run on the higher side of debt settlement. Your credit score will be negatively affected since you are defaulting on your credit agreements. ClearOne Advantage requires a minimum of $10,000 in unsecured debt to qualify. They offer a free initial consultation and no upfront fees. The pricing is 20 - 25% of the total enrolled debt. You do not pay until your debts are settled. ClearOne Advantage has a 90 day, 100% money back guarantee. The minimum debt needed is $10,000. Their fees run between 20 - 25%. Will debt analysis affect my credit? Debt analysis will not affect your credit score since ClearOne Advantage will do a soft pull on your credit to see your accounts and balances from TransUnion. When can I expect to see initial results? You will probably see initial results in the third or fourth month of being enrolled, depending on your monthly payment and amount of debt enrolled. Depending on how much debt you enroll and your monthly payment, it will take around an average of 24 to 48 months to complete the program. What if a creditor makes me an offer? What is the best method to correspond with ClearOne Advantage? You can communicate with ClearOne Advantage through phone or email. However, they recommend calling the Customer Loyalty Group at 1-888-768-4767 for any urgent matters. What are the hours of operation for ClearOne Advantage? Their hours are Monday through Thursday 9 am - 6 pm EST and Friday 9 am - 5 pm EST. If you miss a monthly payment, ClearOne Advantage recommends that you try to make it up to keep your program on track to not lose the settlement with your creditor. ClearOne Advantage will work with you to keep you on track. If you have trouble making your payments, you can contact their Customer Loyalty Group at 1-888-768-4767 EST to discuss your options.